An International Conference on Housing Finance on the theme “Housing – An engine for Inclusive Growth” was organized during April 11-12, 2013 at New Delhi, India. The Conference was held under the combined aegis of National Housing Bank (NHB), the Asia Pacific Union for Housing Finance (APUHF) Forum, whose Secretariat is hosted by NHB, and the Asia Pacific Ministerial Conference on Housing and Urban Development (APMCHUD). The Conference was inaugurated by the Hon’ble Union Minister of State for Finance, Shri Namo Narain Meena. The focus area of the Conference was housing as a contributor to inclusive growth. The programme was structured with a view to deliberate on a wide range of issues being faced by the housing and housing finance industry across the Asia Pacific region, as also the best practices across the globe. The two-day conference saw participation from more than 200 eminent speakers and delegates from over 12 developed and emerging countries. Several speakers presented the status of housing and housing finance in their respective countries. The Conference saw representation from Central Banks of various countries, policy makers, planners, Banks, Financial Institutions, multilateral agencies and academia. The Conference spanned over a period of two days and comprised of nine sessions covering issues relating to increasing urbanization and housing challenges, regulatory and policy framework, housing finance and low income housing, securitization, mortgage insurance / guarantee and lessons from sub-prime. The speakers also deliberated on issues arising from urbanization, slum proliferation, and lack of adequate and reliable data with respect to housing shortage. Further, funding models of various countries and also new evolving products like covered bonds were discussed during the course of the Conference. Members of the developer community also shared their insights and outlook for the housing and housing finance sector. The Conference served as a platform for sharing knowledge, experiences and learnings amongst the Asia Pacific countries for an in-depth understanding of issues related to the sector. The two-day event also served as an advocacy forum promoting the need for affordable and accessible housing and housing finance in the region, engaging attention of various stakeholders and Policy makers. It was strongly felt that the sector required an effective and constructive regulatory mechanism to ensure transparency, accountability and further safeguarding the interest of the end user. The need to protect customers’ interests and promote transparency for their information and decision making was also highlighted. The representatives from Iraq, Afghanistan, Indonesia, Thailand, Malaysia, Nigeria and Yemen gave detailed accounts of the status of housing sector and housing policies in their countries. The need for national level housing policies with emphasis on state and local governments’ sensitization to the need for reforms and efficient processes and approvals was a common theme observed across all countries’ presentations. As a follow up, NHB seeks to step up its advocacy for these reforms and changes with the state government agencies and local authorities through suitable awareness-building and capacity-building measures. NHB is also engaging with International Financial Institutions in this regard. At a Meeting of the Advisory Board of the Asia Pacific Union for Housing Finance (APUHF – a Regional body for Asia/Pacific countries) held in New Delhi on January 31, 2012, R V Verma, Chairman and Managing Director, National Housing Bank was unanimously elected as the Chairman of the APUHF. He succeeds Mr Abdul Qadeer Fitrat, Former Governor, Central Bank of Afghanistan. The membership of the Advisory Board of the Union was also expanded to include representatives from Indonesia and Mongolia besides the existing members from Pakistan, Bangladesh, Sri Lanka and Thailand. The meeting of the Advisory Board was also attended by representatives from the World Bank who joined as Special Invitees. 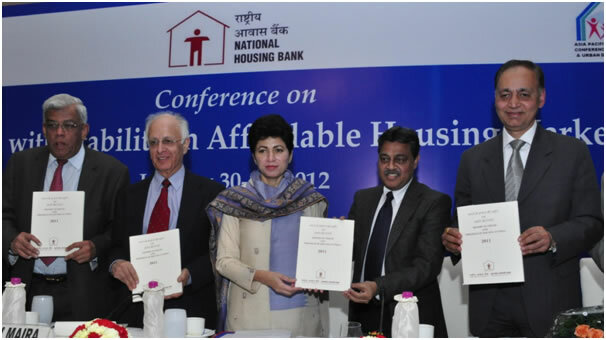 The Report on Trend and Progress of Housing in India, 2011 – an annual publication of the National Housing Bank, was released by the Hon’ble Minister for Housing and Urban Poverty Alleviation and Union Minister for Culture, Government of India Kumari Selja during the recent International Conference on “Growth with Stability in Affordable Housing Markets” held in New Delhi during January 30-31, 2012. The Report on Trend and Progress of Housing in India 2011, captures the trend and performance of the sector as also the performance of lending institutions against the backdrop of economic and Policy framework, domestic and global. The Report outlines and analyses the performance of the sector and of the key lending institutions in housing finance viz. Housing Finance Companies, Banks, MFIs, RRBs and cooperative sector institutions on parameters including housing loan portfolio, loan size and geographical spread, loan tenure, quality of assets etc. during the year 2010-11. The Report also outlines the key Policy announcements, regulatory developments, property market trends and the new initiative of “Central Registry”. The Report has brought out the twin issues of “Scales” and “Affordability” as key challenges in the sector, emphasizing the need for market-based approach as a longer term most sustainable solution. Issues pertaining to land, legislation, urbanization, technology, finance, risk assessment and mitigation tools are some of the issues that the Report has highlighted as key elements in the Policy framework for affordable housing in the country. The outlook for the housing finance sector is identified as positive, with the development of “market infrastructure”, instruments and institutions playing a key role in expansion and stability of the mortgage market in the country. The Report recognizes the financial sector developments – both global and national – in their potential impact on the real estate and housing finance markets in India.